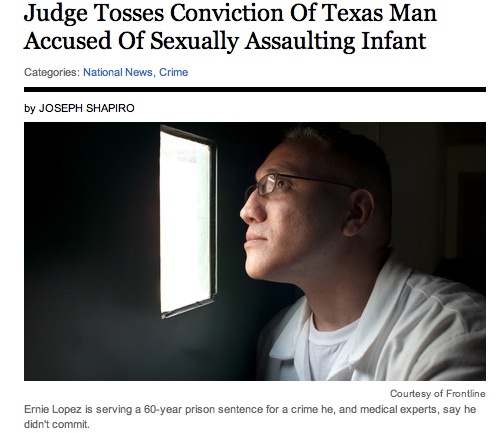 After years of pro bono work by attorneys convinced of his innocence, Ernie Lopez has won a court victory: His 2003 conviction for the sexual assault of a 6-month-old girl has been overturned by the Texas Court of Criminal Appeals. The case also included allegations of infant shaking. The court denied Lopez’s argument of actual innocence, but did agree that he’d had ineffective assistance of counsel, because his attorney had not offered medical witnesses to rebut the allegations at trial. He is now being returned from state prison to the county jail, closer to his family, while prosecutors decide whether to retry him on the original charges and whether to move forward with a murder charge in the same case. The NPR web posting explains more about the highly unusual sequence. He has served nine years of a 60-year sentence for the assault conviction. Last summer’s combined investigation into child death cases by NPR, Frontline, and Pro Publica resulted in articles about this case, at NPR story page, The Child Cases and Pro Publica story.